Major patch today for all interfaces due to the implementation of tabbed chat windows. All UI’s have been updated and tested. There has been a lot of discussion about having the window title showing along with the tab. I have left it all in like Default has, this way if you want to remove it, you can – would be harder the other way around. If you use “Tell Windows”, you may want to consider leaving it the way it is so you can move the window and/or close them when you do not need the window any more. Removing the title of the window will render the window un-movable, but you could resize the window to the location you want (shrug). and scroll all the way to the bottom. Hurrah for patch day! All interfaces have been updated for the 2/20/2019 patch day that includes an update to all inventory windows that have been modified. The Default Old UI and Emulated/Integrated Warcraft UI did not need an update since those windows were not altered. Alt. Currency Tab has been updated to show which currency belongs to which expansion as well as information for that type of currency. Krono has been moved to the Alt. Currency Tab. The Ebon/Radiant crystals have moved to the Alt. Currency Tab. The Evolving items tab has been removed. The Krome UI also now has tribute timers on the Actions Window, as well as a new Raid Window that has the Management controls on a different tab & is fully resizable. This will allow more flexibility for the player to use the window to select raid members efficiently without staring at controls that only the raid leader can use. 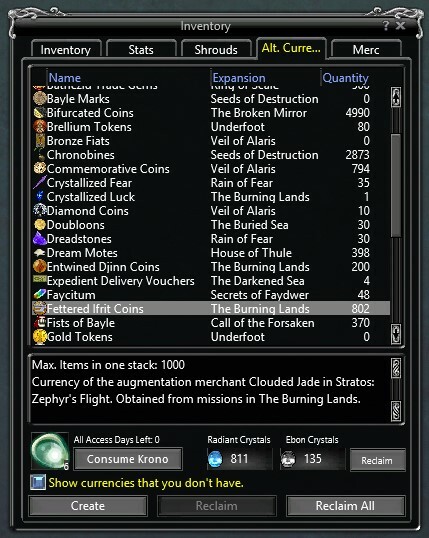 So I decided after staring at the Ebon/Radiant currency on the main tab of the inventory for so many years … wondering…. why the heck don’t they get rid of it and incorporate it into the alt. currency tab… why is the Krono not considered a currency? The first patch of 2019! There are no major updates needed to the interfaces, other than a new button has been added to the Inventory Window for “Reclaim All”. 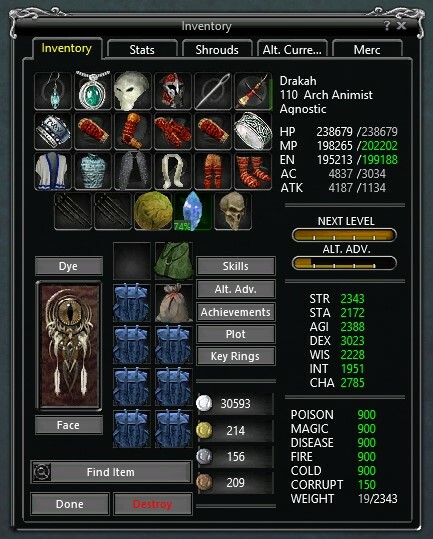 The only UI’s that did not need any updates is Default Old, Emulated Warcraft and Integrated Warcraft, since the Inventory Window has not been modified for those interfaces. I have went ahead and uploaded the Interfaces to be compatible with the launch of The Burning Lands on December 11th. Interfaces have been fully tested and checked on December 9th. If there are any changes that need to be done between now and launch day, I will do them as soon as possible. Feel free to comment on the forums if you need help. Thank you! I decided to simplify the Downloads area to be a little easier to download what you are looking for. Before, you would click the link, it would load a page, click Download, etc. and can take some time to load. Now, you can just simply Download the interface straight from the Downloads page without going into another sub-page. I am still working on tweaking it a little more, but it should be flexible to post Beta files and such for testing. Please let me know if there are any problems. Also, I have decided to open up the Forums again, that I have disabled for almost 2 or 3 years now. I only put up “General Discussion” as that should be sufficient enough but I can always add more if needed. This should alleviate the e-mailing back and forth and others might be able to answer their own questions from your own. Now that we are in beta for The Burning Lands, I will be working on some UI updates for testing. I will work mainly on Default Old & Krome to have them updated as needed – and if time allows, I will work on the others. Please visit the Downloads section where the Beta Zip files will be located under the Interface. If you do not see it, then it has not been created yet. Let me know if you find anything wrong with them, thanks!